Plans to deal with an “obnoxious” smell from a controversial pet food factory are set to be given the green light by planners in Denbighshire. Councillors will consider an application for a 35-metre chimney which would tower over Bodelwyddan and the A55 at the Real Pet Food factory in the village. The Real Pet Food Company wants to build the chimney to deal with strong odours from the site which have led to complaints from nearby residents. The factory began operations in Bodelwyddan in 2017 but complaints about the smell soon followed. To deal with this, the firm began investigations and decided the best way to disperse the odour would be to build the chimney. Planners have recommended that councillors vote in favour of granting permission for the project. But there has been a backlash against the application with over 50 letters from members of the public opposing the plans. 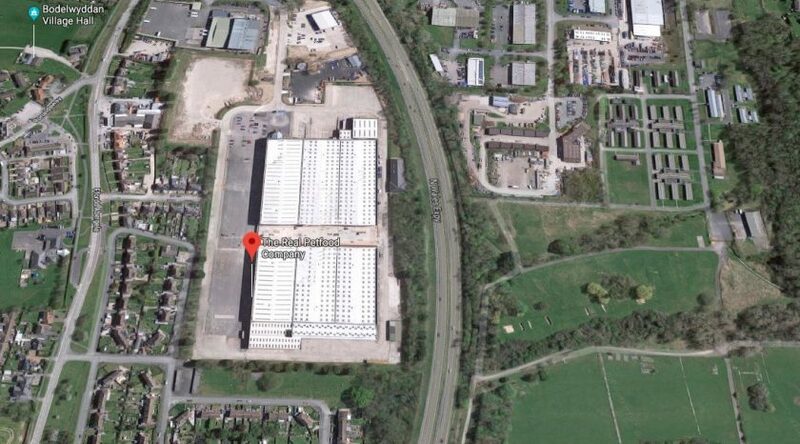 A report before councillors on the planning committee says: “The application proposes a new chimney stack as part of a scheme to address an ongoing odour issue arising from the pet food production process at an established factory unit. “This is a matter which has concerned local residents for a considerable period of time. There are local concerns over the potential impact of the development, in particular on the setting of the Marble Church, the castle, and the conservation area.“The main land use planning issues relating to the proposal are considered to be the visual impact of the stack and the residential amenity impacts concerning the odour issues. Advice from specialist consultees suggests a 35-metre stack at the factory unit will have some landscape and visual impacts, but the significance of these has to be weighed against the benefits of the proposed stack in terms of alleviating odour issues on the site, and the continued operation of an established business. The application will be discussed by the planning committee when it meets next Wednesday.